It is a selection of mandalas. This is a new obsession for me. But I didn’t realise just how many people are also obsessed or at least love mandalas; that is until I saw my facebook hits – they rocketed off the scale! So I thought I should at least tell you more about the mandalas in the photo (and yes, test how far my blog hits go!). Towards the end of February this year something interesting popped into my twitter feed – rent a sheep through the Meadow Farm Wool Project. It grabbed my interest straightaway and I popped over to the website. Within minutes I was renting a sheep! In due course I will receive yarn spun from the fleece of the sheep (well maybe not the exact one I am renting, but from the same flock). I am not an expert on fleece but I know Jacob will be strong and probably good for hardwearing items. 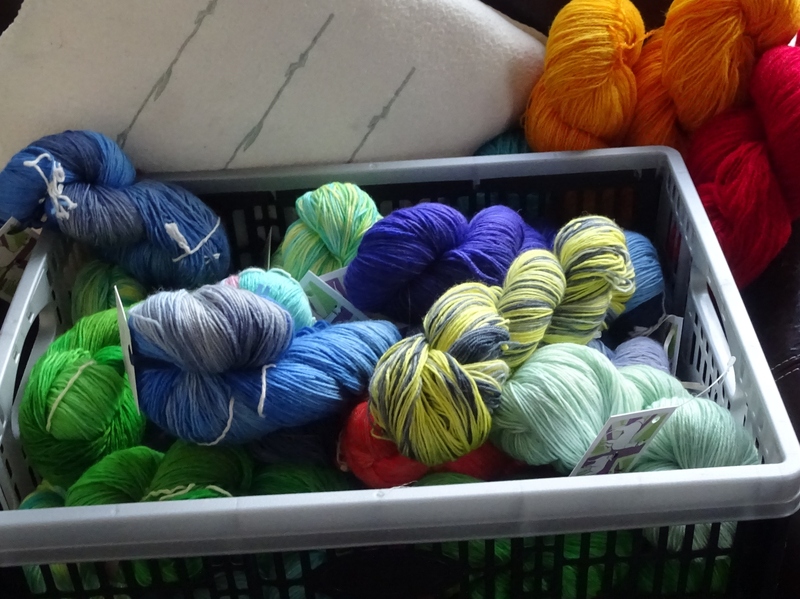 This is a great project, with excellent provenance for the wool – grown in Somerset and spun in Yorkshire – British through and through, and by renting a sheep I am also supporting 2 excellent charities – The Teenage Cancer Trust and Headway. The project will have ideas on patterns for the yarn in due course. But I am impatient! 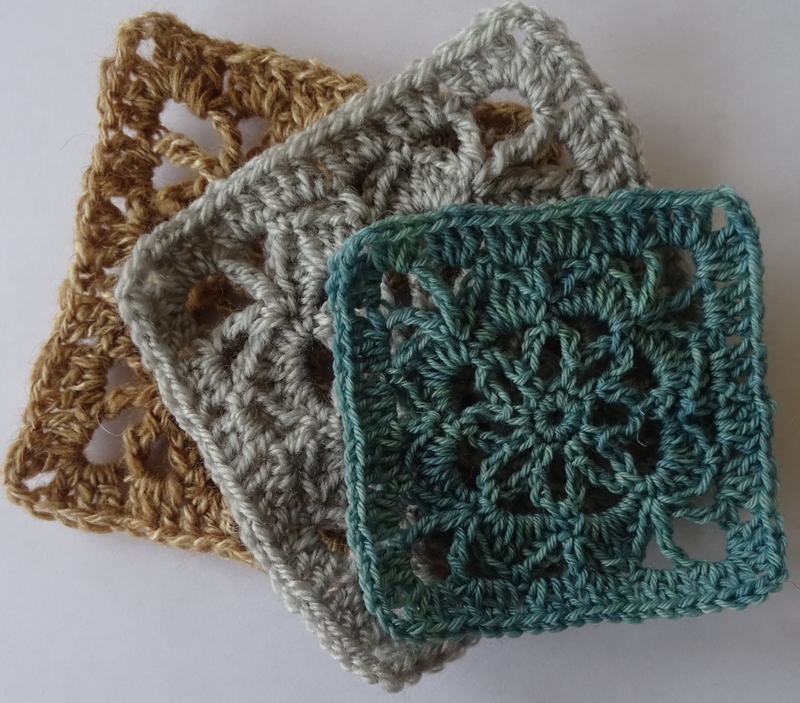 So I decided I should design a crochet motif for the yarn, and not just for me. 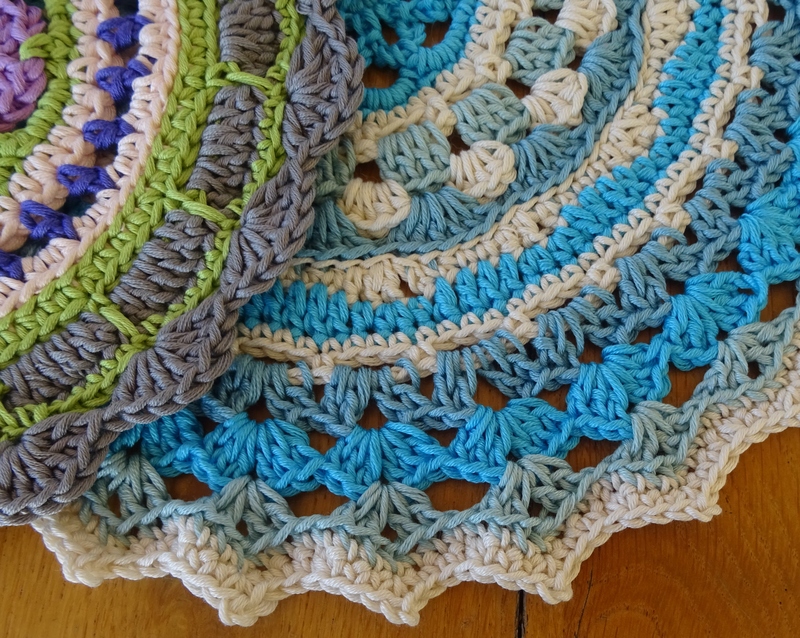 I think Jane and Annie (who established the project) would appreciate some pattern support, and I think their project is extremely worthwhile – so the design is for them. They will be sending out the motif to all sheep renters. 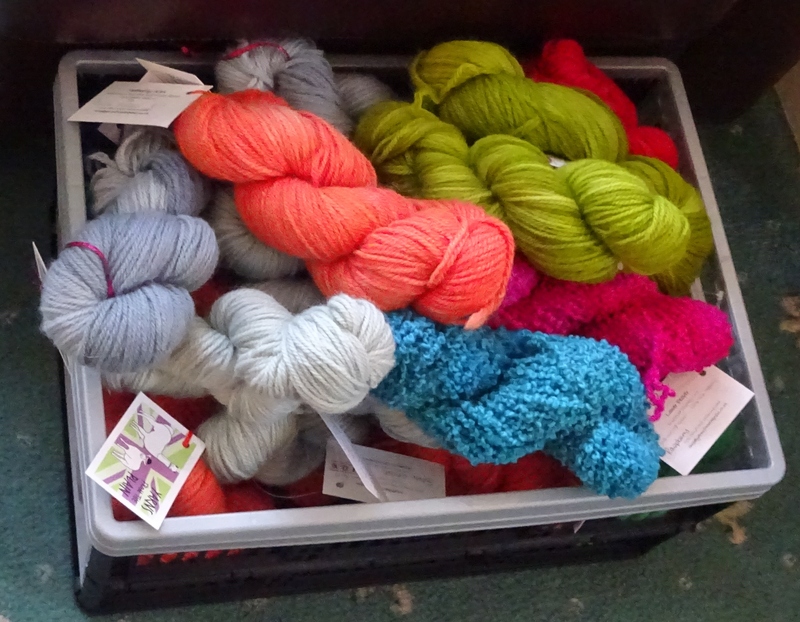 I can’t wait to receive my yarn, I think I will be making some lovely cushion covers with my motif. 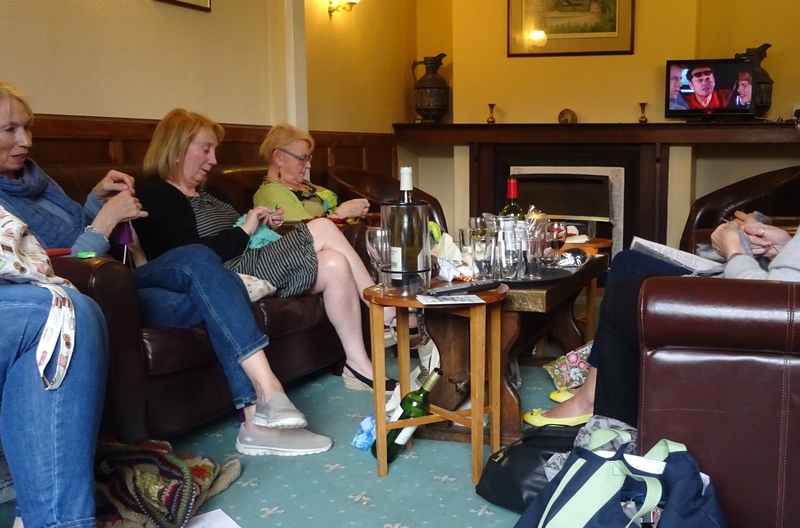 I have a few more little joys to share with you from my Buxton holiday! 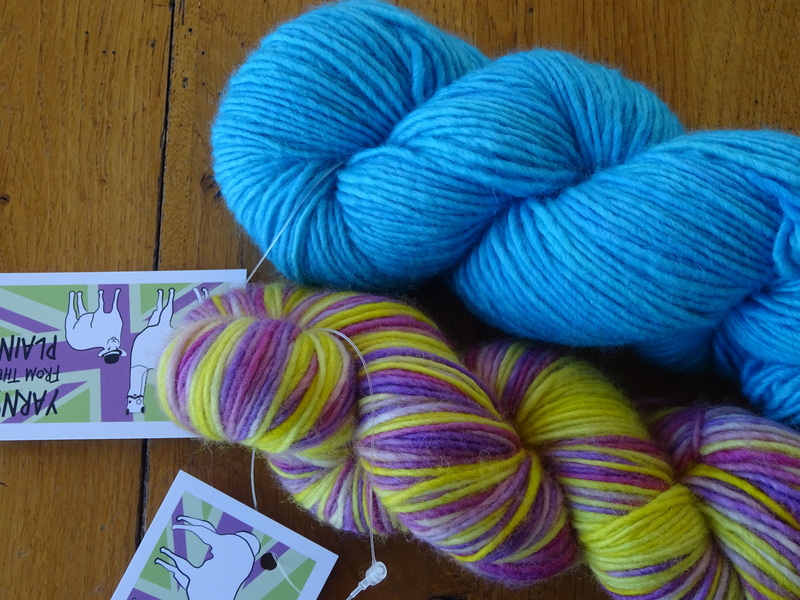 They are both the same yarn base called Plumley – a single spun yarn, 100% Blue Faced Leicester Roving DK, approx 200m per 100g skein. Have I ever told you I love single spun yarn? It is so smooth to work with. So I was overjoyed to see Nic had started dyeing some. I will be back for more! I will share more when the designs are more advanced, or closer to publishing. My mandala obsession is only just beginning! Whenever I design anything I always swatch various ideas and some of them are changed or discarded altogether before I settle on a design. This is not unusual, I am sure most, if not all, designers do something like this. When designing the squares for the Blog Blanket CAL, I swatched one square which I decided wouldn’t be appropriate – I needed it to finish on a solid round and the 8 round version would end on a granny round. But it wasn’t discarded, I liked it so I just put it aside waiting for some other use. 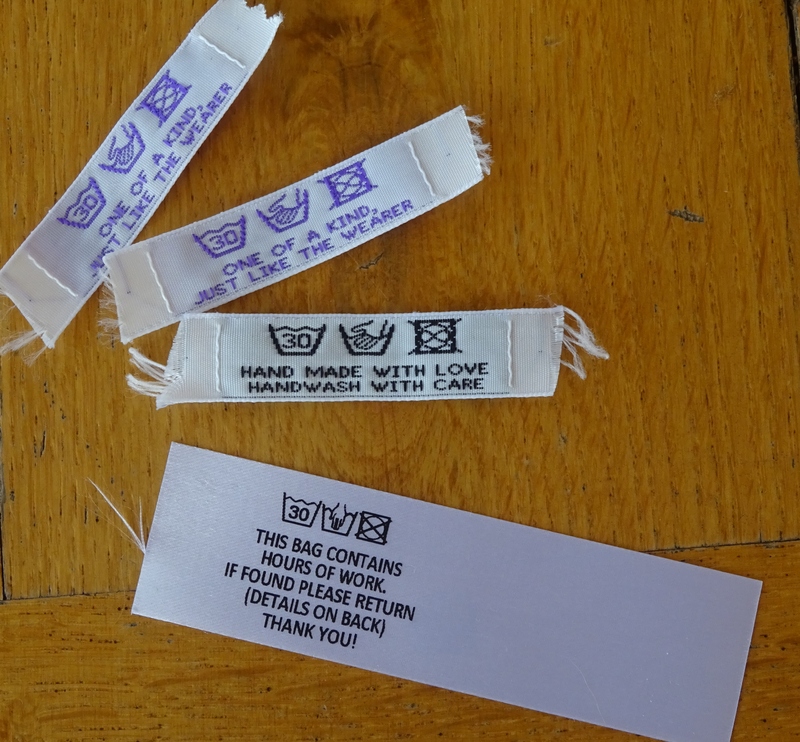 This is my original swatch and……………there’s an error in it, but I won’t tell you where! That other use just came up. 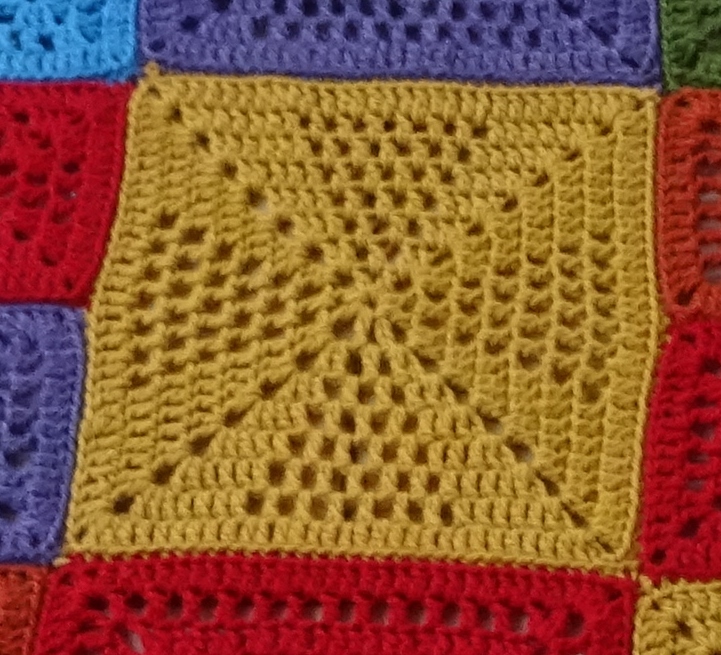 I am making a small blanket and I thought a huge granny square using the design would be perfect. It would be quick to make but also have just enough interest to avoid being boring to make. 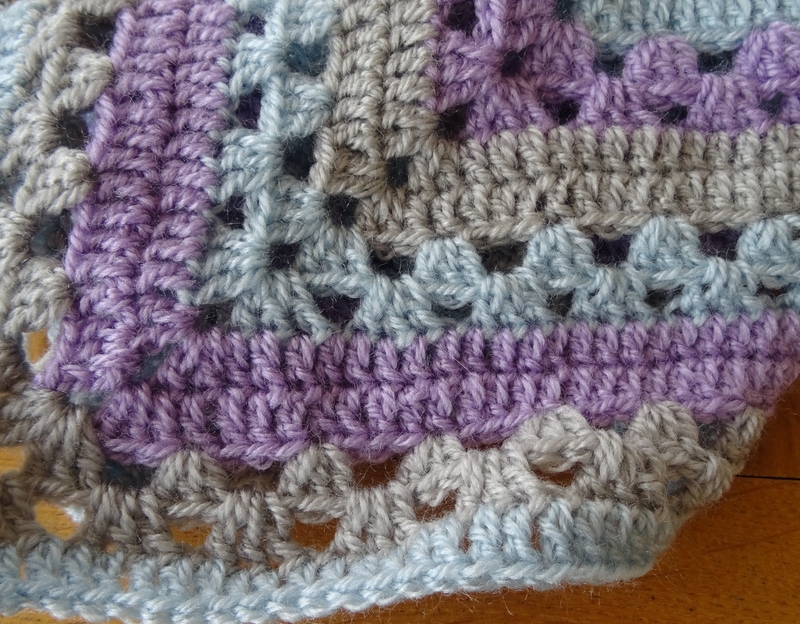 The blanket was started yesterday, and I have already completed 15 rounds. I decided to swap colour every 2 rounds because the pattern changes then (which is what I did intuitively on my original swatch). But when I got to Round 6 I thought it looked familiar. And then I realised it is similar to Attic24’s cosy stripe blanket. 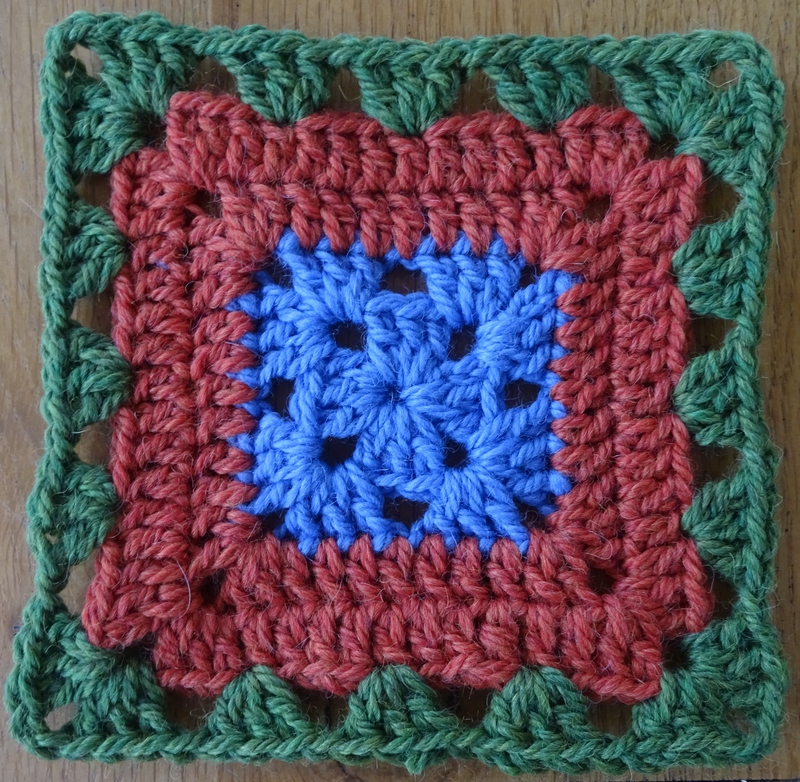 Of course, it wasn’t planned and it does have 2 significant differences – firstly it is a granny-style square not a stripe and second I use some chain sts in this square. If you wanted to make an Attic24 cosy stripe-style granny blanket then it would be easy to adjust the pattern by removing the chain sts and adjusting the number of trebles along each ‘granny’ round – but I wanted to continue with my own design. I changed colour every 2 rounds, simply joining the new colour where I started each round with a ss. Round 1: 5ch (counts as 1tr, 2ch), (3tr, 2ch) 3 times into the ring, 2tr into the ring, join to 3rd st of starting 5ch with a ss. Round 2: ss into 2ch-sp, (note for this and each subsequent round: this ss is to position the start of the round in the right place) 5ch (counts as 1tr, 2ch), (3tr, 1ch) into the same 2ch-sp, (3tr, 2ch, 3tr, 1ch) into each of the next three 2ch-sps, 2tr into the first 2ch-sp, join to 3rd st of starting 5ch with a ss. Round 3: ss into 2ch-sp, 5ch (counts as 1tr, 2ch), 2tr into the same 2ch-sp, 1tr into each st around (working into the 1ch not the 1ch-sp), (2tr, 2ch, 2tr) into each 2ch-sp, and work a final 1tr into the first 2ch-sp, join to 3rd st of starting 5ch with a ss. Round 4: ss into 2ch-sp, 5ch (counts as 1tr, 2ch), 2tr into the same 2ch-sp, 1tr into each st around, (2tr, 2ch, 2tr) into each 2ch-sp, and work a final 1tr into the first 2ch-sp, join to 3rd st of starting 5ch with a ss. Round 5: ss into 2ch-sp, 5ch (counts as 1tr, 2ch), (3tr, 1ch) into the same 2ch-sp, miss 3 sts, [*(3tr, 1ch) in next st, miss 3 sts; repeat from * to next 2ch-sp, (3tr, 2ch, 3tr, 1ch) in 2ch-sp, miss 3sts] 4 times but on the last repeat of this just work 2tr into the 2ch-sp at the start of the round, join to 3rd st of starting 5ch with a ss. Round 6: ss into 2ch-sp, 5ch (counts as 1tr, 2ch), (3tr, 1ch) into each 1ch-sp around and (3tr, 2ch, 3tr, 1ch) into each corner 2ch-sp, 2tr into the first 2ch-sp, join to 3rd st of starting 5 ch with a ss. Repeat Rounds 3 to 6 until you have a blanket the size you want. I plan to finish on a Round 4 so I have a nice edge. I wanted to brighten up a corner and I decided there was no better way than with a little crochet. However, I wanted something small not as big as a blanket or cushion. After some thought I decided to try a mandala. 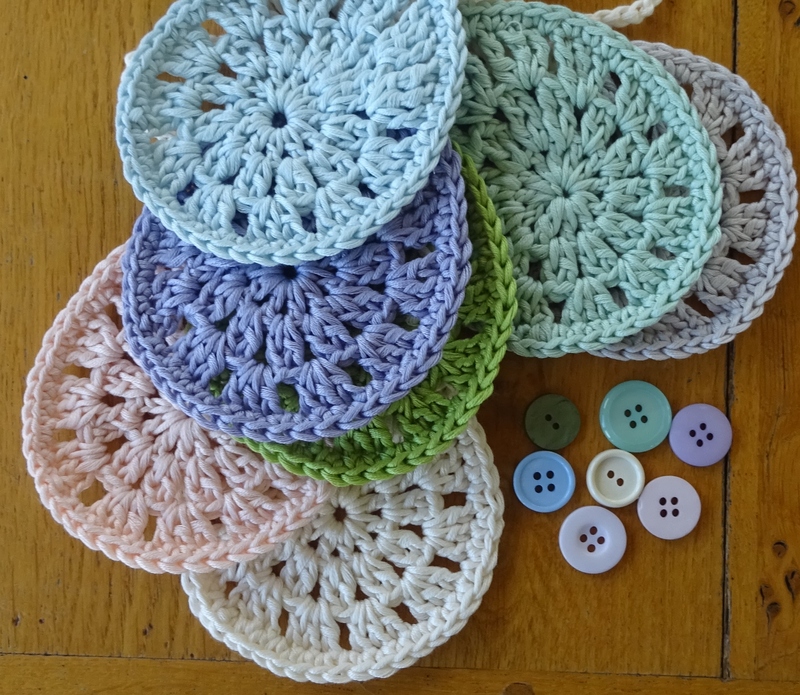 I have never made a mandala before let alone designed one but it is only a large round motif and I have lost count of the number of motifs I have designed…….. 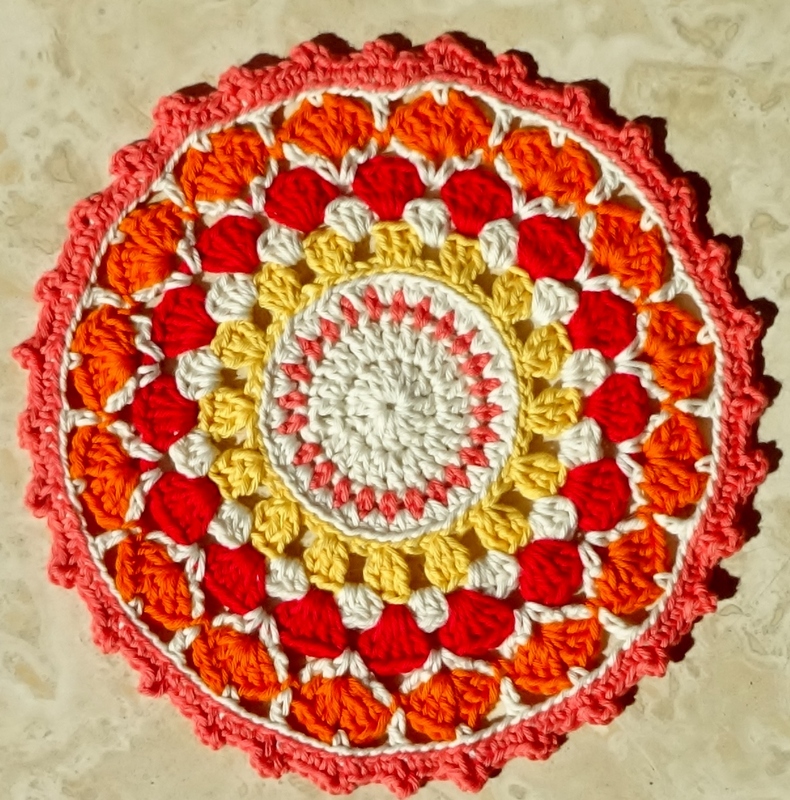 I enjoyed making it, which came as a surprise to me because I hadn’t even imagined that mandalas had a use, nor that I would design or like one! But I did enjoy it, and now I am thinking about making another………. 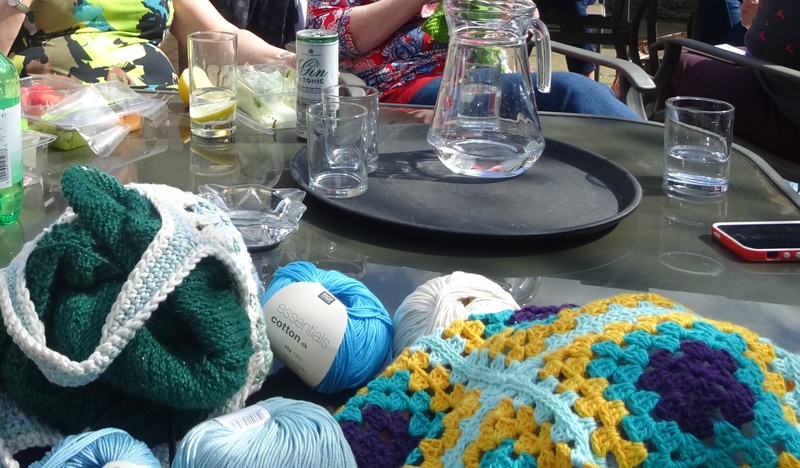 Oh, and when I dropped it I discovered that yarnaddictcat also liked it – well, I’m not surprised really! 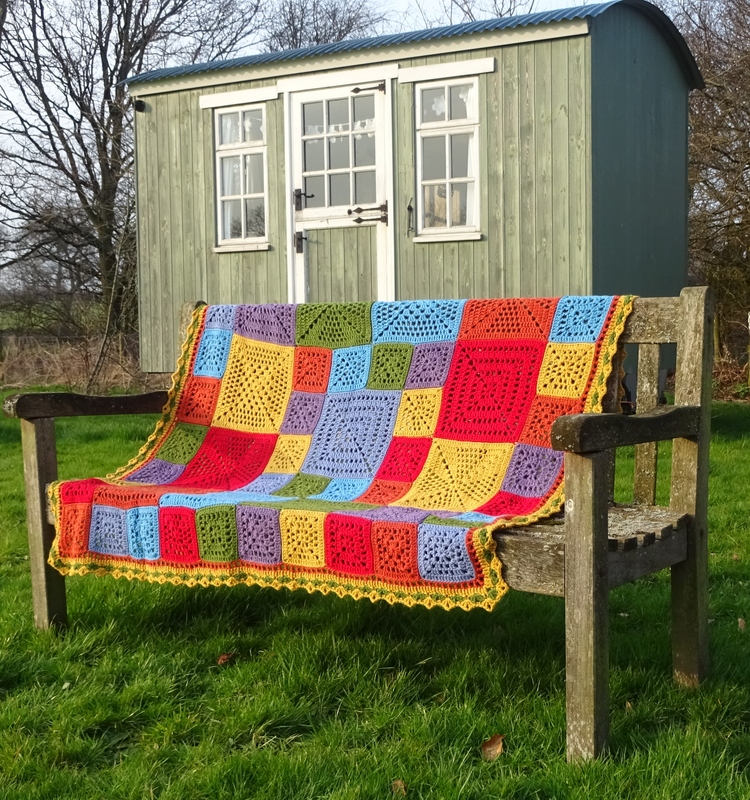 When I photographed it on the bench I realised that I would make a sturdy outdoor blanket, so I expect plenty of use from it this spring. 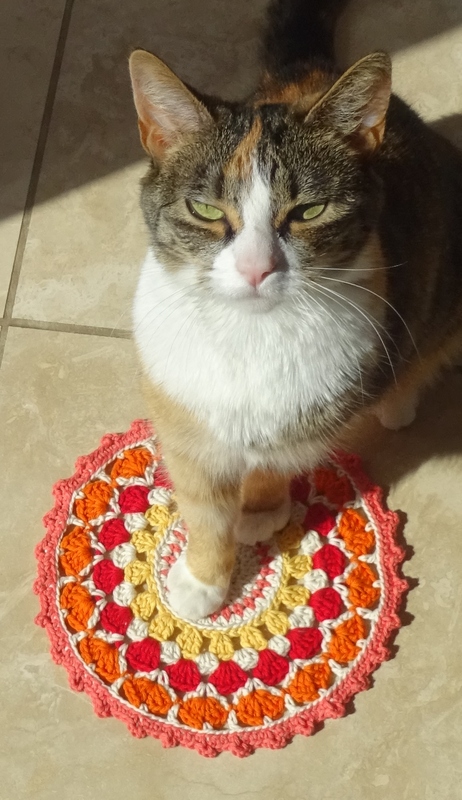 The final part of the pattern for you is the border I used. But of course you may use any border you like. I made the border a couple of weeks ago, in fact I made 3 borders. At first I tried a simple one, but I didn’t like it. Then I tried something more substantial, but that looked odd. So I had to frog it all back twice. I realised one of the reasons I didn’t like the border was the colours I used – originally blue and orange. 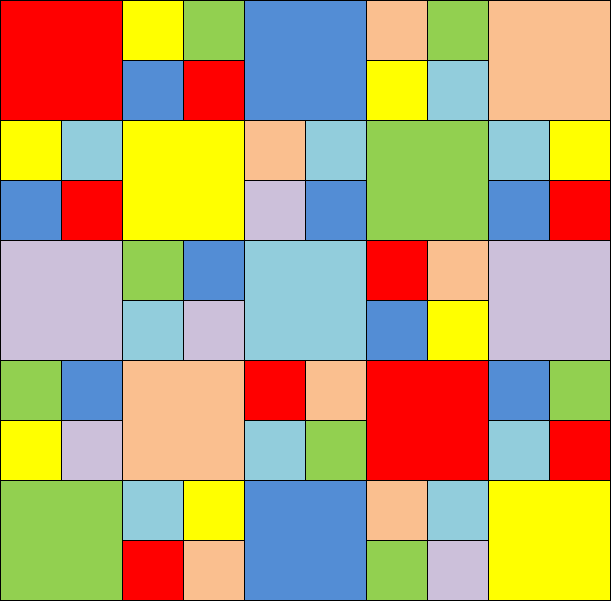 The orange worked well next to the squares but the blue was totally wrong. 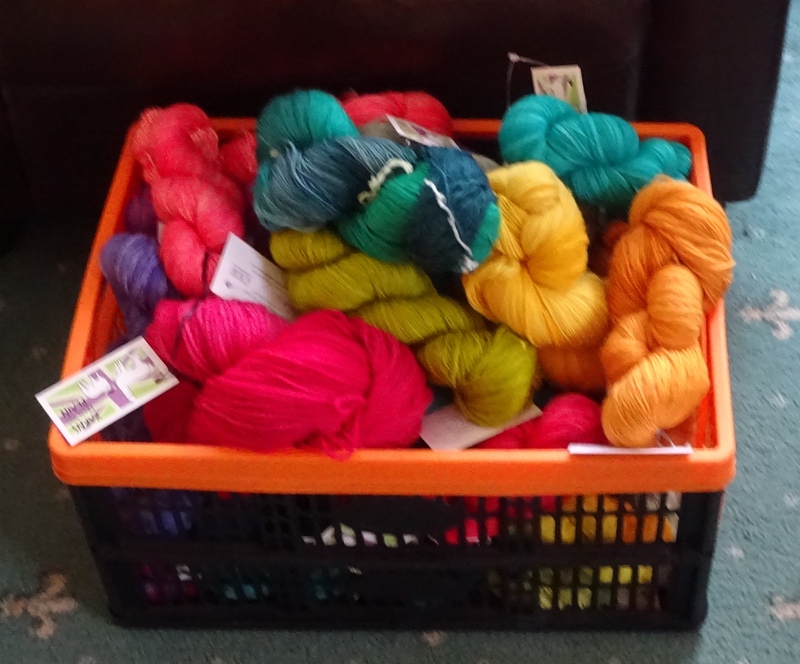 So I looked at my remaining yarn scraps, chose some colours I preferred then ordered more yarn – no good trying to make do with what I had. My border used a just under 4 balls of Drops Nepal (aran weight, 75m per 50g ball) – I used 2 of Goldenrod (yellow), 1 of Orange and 1 of Green. Round 1 – using Orange, starting one stitch to the right of a corner, ss in the back loop of each stitch around, join the round with a ss. This gives a nice firm and crisp edge to work the rest of the border from. Round 2 – again you should start this round one stitch to the right of a corner and ensure you work through the ss from round 1 and the back loop of each square for a good firm finish, *(1htr, 2ch) in this st, (1dtr, 2ch) in next st, then work (1htr, 1ch, miss 1 st) repeated along the side edge to the stitch just before the next corner; repeat from * until end of round, join the round with a ss to the top of your first st, break yarn and fasten off. NOTE: I had 85 htr and 84 1ch-sps along each side and (2ch-sp, 1dtr, 2ch-sp) in each corner. Round 3 – using Yellow, work 1htr in each stitch around (counting each htr and ch as a st and working into the ch not the ch-sp), in the corners I worked (1tr, 2ch, 1tr) in the corner dtr st, join the round with a ss, break yarn and fasten off. (NOTE: I had 175 sts along each side and a 2ch-sp in each corner, ideally you should have a multiple of 6 sts plus 1 along each side). 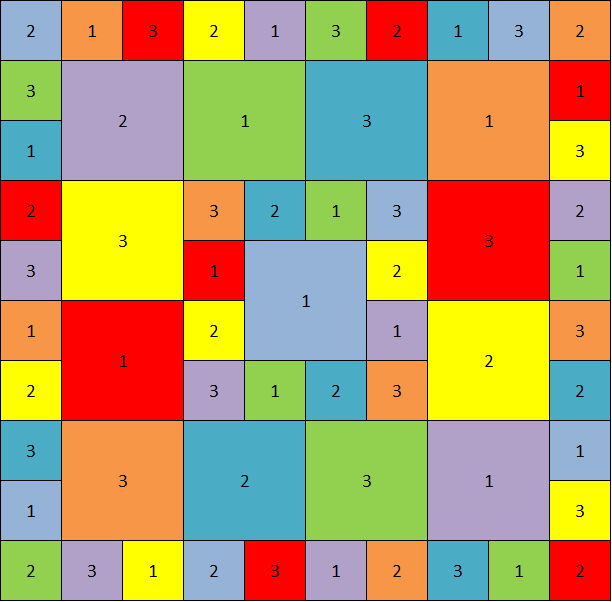 Round 4 – using Green, start in the tr just to the right of a 2ch-sp corner, 1dc in tr, *(2tr, 2ch, 2tr) in 2ch-sp, 1dc in next tr, [miss 2 sts, (2tr, 2ch, 2tr) in next st, miss 2 sts, 1dc in next st] repeated to next corner 2ch-sp; repeat from * until end of round, join the round with a ss, break yarn and fasten off. Round 5 – using Yellow, work (2tr, 2ch, 2tr) in each dc and 1 dc in each 2ch-sp around, join the round with a ss, break yarn and fasten off. Sew in all loose ends. I blocked my blanket, taking up the most of the floor space in the spare room for a couple of days! With the border (which is about 6cm/2.5″), it ended up at about 140cm/55″ square. 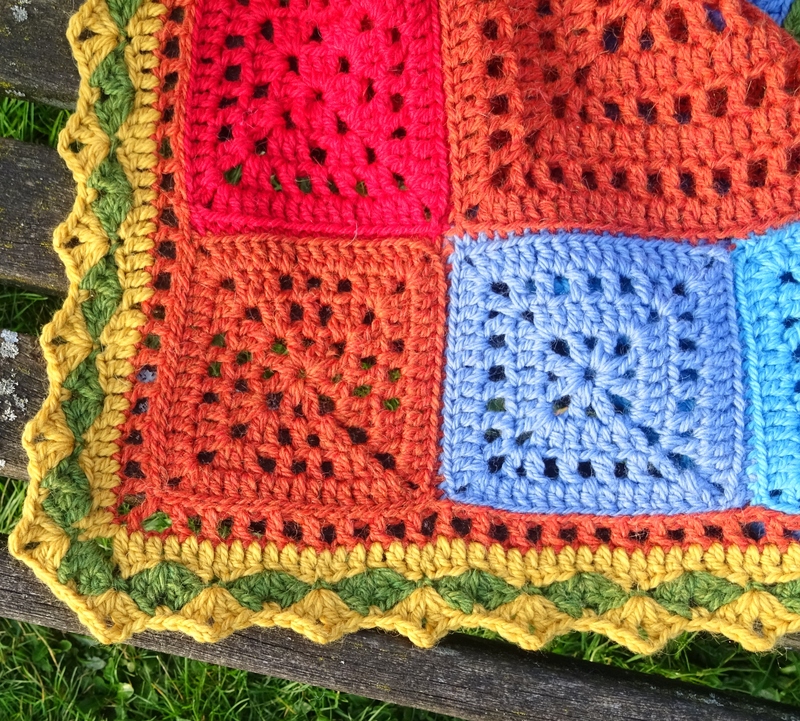 For me, most of the pleasure is in seeing your finished blanket, so please share a photo. For those of you who celebrate/enjoy the easter weekend – Happy Easter! For those who don’t, Happy Sunday! 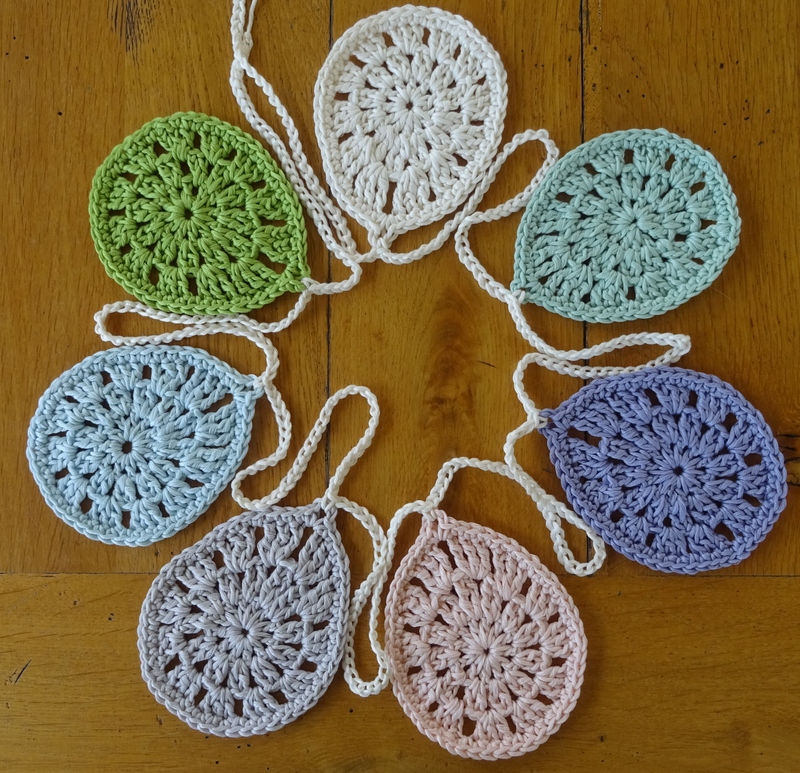 So please join me in some crochet if you can, and to entice you I am offering my Easter Egg Bunting pattern free until midnight GMT tomorrow (6th April). The pattern is here on Ravelry and you need to use the coupon code HAPPY EASTER at checkout to obtain the free pattern. 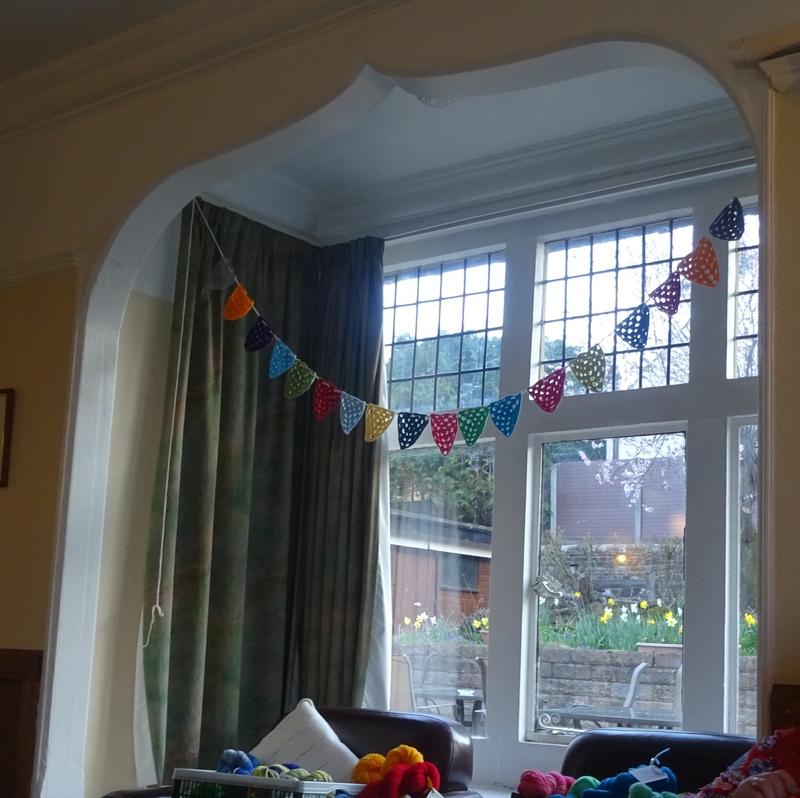 The Bunting is based on granny stitches, so is quick to make. You can adorn it with buttons, beads, ribbon.